Oh, let me see now. How about Belfast? Err, no. I don't think so. Yes, yes, yes, northern Lancashire. I was just being sarcastic. Right - tell me about the history of this one then. Well, the proposals first come to life in the 1940s, as an all-purpose route, bypassing Lancaster to the north. Main Route from Morecambe and Heysham to the North-South Motorway (Route 1). Commencing from Torrisholme at the junction of routes 373, 374 and 375, A.589 is followed eastwards for nearly 1/2 mile, form at which point a new motorway runs in a north-easterly direction to connect with Route 1 at Halton. A connection is proposed where the new route crosses Route 371 (A.6) north of Lancaster. Dual 2-lane carriageways are proposed. It was described as one of the "Second Group Routes", which were more local links within the county, often from large towns to the main motorway network. "Route 1", by the way, translates into the modern M6. The next appearance of the motorway comes in 1960, when Lancashire County Council published "Lancashire Roads: Situation Report 1960". It is pointed out within the document that, despite the fact that the Morecambe area was second to Blackpool as a holiday resort, the access via road was very poor, with traffic from the south having to drive via the centre of Lancaster and over one particular bridge (the Skerton Bridge) crossing the River Lune right in the city centre. This was considered to be unacceptable. The cost in 1960 was given as about £1,125,000, and it was expected that around 9,000 vehicles per day would use the Link Motorway and the Lancaster Bypass section of M6 instead of driving through the city centre. After that 1960 report, it all goes a little bit quiet. There's a few mentions here and there - including ones in North West Road Construction Unit documents from the 1970s. This route basically falls flat like other proposed smaller motorways - needed and always there, but not high enough priority to ever make it off paper and onto the ground. Lancashire County Council has a webpage all about the new route. It can be found here. Can you show me the route? I couldn't believe anyone would spend good money on an enhanced link to Morecame (out of it, maybe!) until I checked out the plans to which you link. Lo and behold, this looks much more like an exercise in rebuilding M6 junction 34. For the uninitiated, that junction is unchanged since the day it was built and is spectacularly unsafe for traffic joining the M6 northbound. Think of two unusually tight 90-degree bends back-to-back to prevent you accelerating, then almost no merge room onto the M6, on which the lorries have picked up speed on the fast downhill before the River Lune bridge, which doesn't have a hard shoulder. I suspect much of the price tag for the link will come from the new structure across the Lune to carry the new on-ramp northbound: money very well spent, to my mind! A thought occurs to do with the Morecambe Link Motorway. It's well established that M6 junction 34 at Lancaster was originally meant to be an emergency services access point, opened to the public as a last-minute decision before the ribbon was cut, which explains its horrendous design. It was opened up because there was no junction immediately adjacent to Lancaster, which was considered unacceptable. 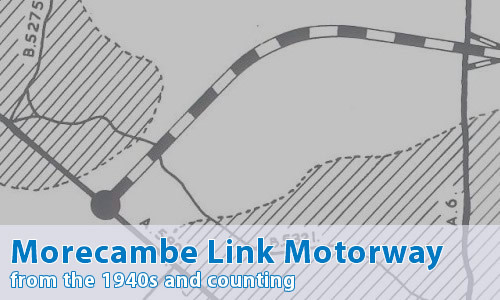 Your map of the Morecambe Link Motorway shows it hitting the M6 just north of the Lune Bridge, and it would have had a junction on the A6 north of Lancaster. Seems very likely, then, that J34 was only opened up as a temporary measure until there was a proper motorway junction for Lancaster! Your map of the MLM shows it joining the M6 a short way north of J34. At this point northbound traffic on the M6 is doing a bit of puffing and panting on the quite steep gradient up from the Lune bridge. I wonder if the planners had any reservations about the extra difficulties this might cause to traffic, with already slow-moving vehicles perhaps being impeded by joiners and losing a lot of forward speed.